As I edited the photos I'd taken of Sun City, our 2-year-old looked at them and clamoured for "more, more, more, I want more please" (which summarises our visit to the Sun City Hotel better than I could). The Sun City Hotel is the original hotel in the Sun City resort, and opened in 1979. For a hotel from that era, I was pleasantly surprised at what a modern feel the room had - lovely bath, toilet with modern flush, neat desk. I've stayed in the Ritz Hotel in Cape Town before, which is also iconic and from the same time, but the room there felt very 70s. The highlight of the stay at the Sun City Resort was lazing the days away at the Valley of the Waves and dining at the Santorini restaurant. Staying at the Sun City Hotel, one can freely enter the Valley of the Waves, by walking through the entertainment centre some 200m away. Towel rental is also free if you're staying at the Sun City Hotel, and you get a discounted rate on beach umbrell's (but we saved that expense by simply sitting under the shading they've built there). What was a bit odd is that you're not allowed to take your own food into the Valley of the Waves (we left ours with the helpful gentleman at the entrance...but we did get the feeling he was doing us a favour by helping us out there), which of course means you have to pay the prices they charged for food and drinks (e.g. R21 for an iced tea). The weather was glorious, and I've come to the conclusion that September is a great month to be at Sun City and enjoy the Valley of the Waves. As you exit the entertainment centre on your way to the Valley of the Waves, you'll see the Kong Gates, with an inscription reading "The massive Kong Gates once guarded the entrance to the valley of the ancients. They were built to keep out the Sasangador, a ravening six legged carnivore that preyed on the villagers. The splintered timbers show how strong this extinct beast was." Sun City's Sacred River, offers the opportunity to laze your way round on a tube, going under bridges and through caves, rapids and fountains. I made my way around with my delighted 2-year-old. Next to the river is a plaque reading: "Sacred River: When the ancients had nearly finished digging a moat around some of their dwellings, they struck an underground river, filling the moat with a gentle, circulating current which flows to this day. The awestruck people named it the Sacred River, a river with no end." Whilst anybody can go for tube rides on the Sacred River (small ones accompanied by adults), there are also some more vertical rides for those a little older - include a very high and steep ride, and a tube ride which is underground, so you cant see where you are about to go. Without a doubt, the Valley of the Waves was the highlight of our stay at Sun City, and our 2-year-old was raving about it for days afterwards. You can get fake tattoos done at the Valley of the Waves. Our little one loved the panda and seahorse tattoos (they fade away after about 3 days). Even the bees know that it's all good at the Valley of the Waves! At the Valley of the Waves there's a fun trampoline to jump on. Ten out of ten for the courtesy of the staff members at the Sun City Hotel and in fact everywhere in the Sun City Resort - they are very very helpful and very well trained. There are loads of games in the entertainment centre for kids to play. We had dinner at the Santorini restaurant next to the Cascades Hotel. To get there in the evening, we walked through this tropical forest filled with lights which made it look like a fairyland, and as we ate we could hear the monkeys screeching in the jungle. We had lunch there the next day, and the setting which the restaurant is in, is absolutely stunning during the daytime. The Santorini restaurant is situated amongst pools and forest. It's pleasant to sit under the shades with the view of the pool and forests. 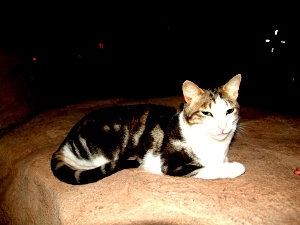 A stray cat at the Santorini restaurant. Dolmades, spanicopita, halloumi and falafel for starters. While eating we noticed how the trunk of this tree was shaped like people stretched out. Our daughter went for the pizza slices. The entrance to the Santorini restaurant if you want to dine indoors. Santorini Restaurant in foreground, Cascades Hotel in the background. Who would have thought there could be so many interesting things happening in a hotel room. We were staying in room 645 in the Sun City Hotel (the top floor). When we got back from our walk and opened the windows, there was the unmistakable and potent smell of marijuana wafting through the air. A few minutes later a vervet monkey appeared outside our window, peering inside to see whether there was anything of interest to help itself to. There was no wireless internet in the rooms. For most people that's not an issue, but for the odd internet junkie like me it hurts (especially since I'd been enjoying internet access in the rooms the previous day at the Bakubung Bush Lodge). Having said that, the 3G signal is fairly strong (not the weaker GPRS signal which we've experienced at other out-of-the-way places). The curtains did an excellent job of blocking the light out in the morning, but this was negated by the fact that there was a (locked) door between our room and our neighbour's room. Our neighbour started playing music in his (yes, I could hear it was a him) room from 6am, which also served to wake us up, as the fact that there was an interlinking door meant that noise flowed freely between the 2 rooms. Sound-proofing on the doors may help prevent the sound coming through the doors. This is the most ants we've seen in a hotel room since we stayed at the Auberge in Yzerfontein. I don't know whether Sun International has an exclusive agreement with Avis Car Rental at Sun City, but they were the only option for car rentals at Sun City which I saw there. I saw Avis parking and at the visitor entrance there was an Avis Car Rental kiosk. We didn't actually stay at the Cascades Hotel, so cant comment in detail, but it looks impressive, and there are some good views from the top floor (and the lifts to the top are interesting - you can see out of them). Cascades Hotel in the background, pools in the foreground (from Santorini restaurant). From the top floor, we can see the Cascades Hotel on the right and the Sun City Hotel in the background. View of the Gary Player Country Club from the top of the Cascades Hotel. Cascades Hotel at the Sun City Resort. We'd love to show you what it looks like inside and its views, but we weren't allowed to get into the Palace of the Lost City - the doormen wouldn't let us in (hopefully we'll get another opportunity at some stage to properly showcase it). Fountain outside the Sun City Palace where people like to have their photos taken. Doormen guarding the Palace of the Lost City (only residents may enter). Amphitheatre at the base of the Palace of the Lost City. View of the Sun City Palace of the Lost City from the Valley of the Waves. Pool at the base of the Palace of the Lost City. Pool bar at the base of the Sun City Palace. A Sun City employee by the name of Frans drove the bus taking us from the Sun City Hotel to the Palace of the Lost City. Frans waited for us to take our photos and try to get into the Palace of the Lost City, before driving on and dropping us off at the Entertainment Centre, and was extremely helpful in telling us about the resort and where people like to take photos. Sun International - look after Frans, he's a credit to your organisation. Photos of the Sun City Hotel. This casino chip waterfall is in the middle of the Sun City Hotel.